Supreme Obstacle Course 50 feet long and water slide seasonally! Attendants: 3 staff OR 1 staff + 3 volunteers. Survive the Obstacle Course, Race against your friends, and team mates, in the Supreme Obstacle Challenge! Awesome inflatable is 50' long x 10' wide x 15' high! This obstacle course is perfect for company events, High School Graduations and parties. Minimum of three (3) supervisors required which can be 3 Air Castles staff OR 1 staff + 3 volunteers to keep prices down. 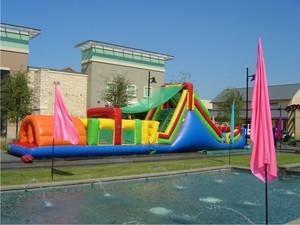 This awesome Supreme Obstacle Challenge in one inflatable unit is worth waiting for, just to have at your group's event. This party pleaser gives non-stop inflatable fun. Children can climb, slide, survive, and race all in one attractive, cleverly designed unit. There are tunnels, a rock wall, slide, pop ups, and a log climb to challenge! This Supreme Obstacle Challenge will rent fast, so book early for this sure fire winner!